(Bloomberg) -- Yellow peas are joining canola as a big concern for Canadian farmers amid an ongoing trade spat with China. After India placed tariffs on various agricultural commodities last year, China stepped up as the top buyer of Canada’s yellow peas, used to make vermicelli noodles, a popular Asian food. But since March, the price of peas has declined by 7 percent, similar to the fall seen with canola, Canada’s top crop export. The drop is significant following a year when Canada shipped 1,389,500 metric tons of peas to China, an 84 percent rise in just one year. The Asian giant suddenly represented a C$717.9 million ($537.57 million) market for Canada. 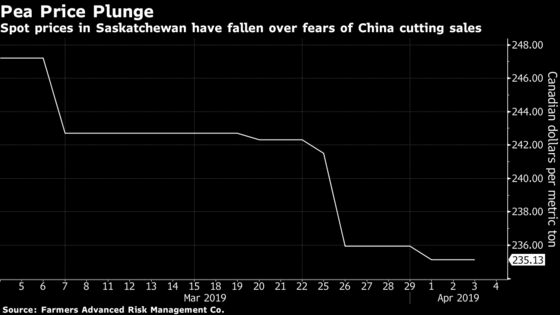 "We have grown to be incredibly dependent on the Chinese market for peas as well, so if you tamper with that market -- even it be just a fear factor -- that matters to the price," said Marlene Boersch, analyst at Mercantile Consulting Venture Inc. in Winnipeg, in a phone interview. India started placing import tariffs on pulse crops in late 2017, with exports dropping 83 percent last crop year to 325,700 tons. Spot yellow pea prices in parts of Saskatchewan slipped about 7 percent in March, according to data from Farmers Advanced Risk Management Co.
"Yellow peas are challenging in the new crop year," said Dale McManus, a broker with Johnston’s Grain in Welwyn, Saskatchewan, by phone. "They’re a very easy crop to grow and easy to store, but with India’s and China’s regulations against them right now, the price has probably dropped 50 to 75 cents." The pet food market, which has became a larger buyer of Canadian peas, is full and not buying currently, factoring into the price drop.